South Dakota’s unique history makes it a fascinating place to study; much of the history of South Dakota parallels that of North Dakota. The land that became South Dakota changed hands many times. In its early history it was inhabited by Sioux Indians. After white explorers entered the area, it belonged to France, Spain, and England at various times. Following the Louisiana Purchase, land that would become South Dakota came under American control. Settlers in the area came first for furs and later for the lure of gold and other precious metals. Homesteading, cattle ranching, farming and railroads also affected population growth. 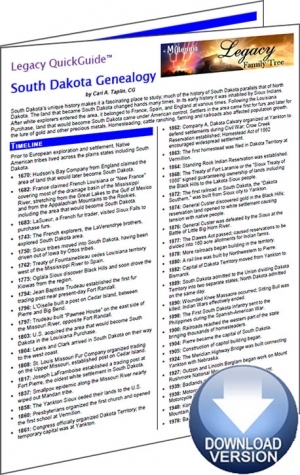 The South Dakota Genealogy Legacy QuickGuide™ contains valuable research strategy to help you find your Mount Rushmore State ancestors This handy 6-page PDF guide can be used on your computer or mobile device for anytime access.